Jeff Auger and Luke Gardiner load bags of oysters from a hatchery into growing cages on the Damariscotta River in Maine on a bitter cold Jan. 7, 2015. 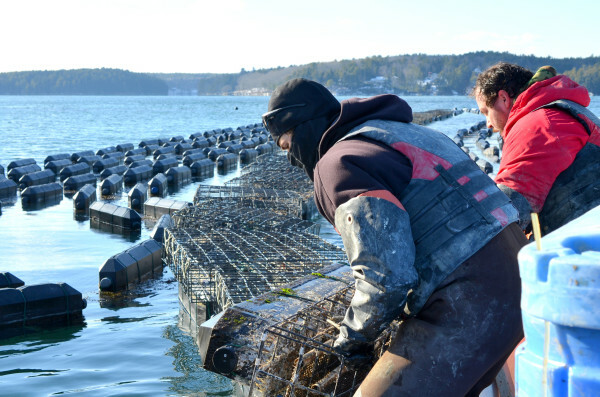 They work for Mook Sea Farm, whose owner Bill Mook has studied the impact of ocean acidification on his operation and helped develop a state plan for combating the problem. 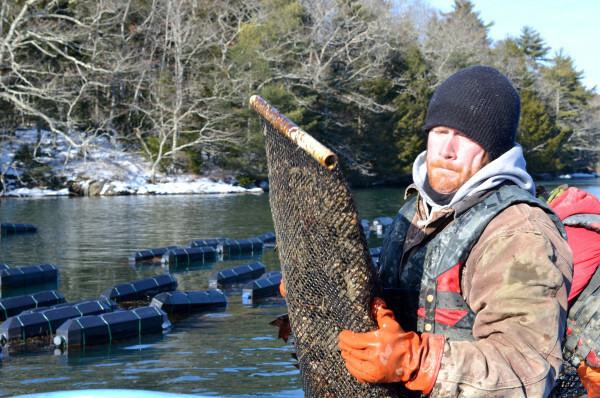 Nate Jones harvests bags of oysters from cages on the Damariscotta River in Maine on a bitter cold Jan. 7, 2015. He works for Mook Sea Farm, whose owner Bill Mook has studied the impact of ocean acidification on his operation and helped develop a state plan for combating the problem. Oysters in the Mook Sea Farm hatchery in Walpole, Maine, on Jan. 7, 2015. The farm's owner, Bill Mook, has studied the impact of ocean acidification on his operation and helped develop a state plan for combating the problem. AUGUSTA, Maine — Lawmakers on Thursday unveiled four bills related to efforts to slow the acidification of Maine’s coastal waters, which threatens many of the species that make up Maine’s lucrative fishing industry. Rep. Mick Devin, D-Newcastle and the most vocal voice in the fight against acidification, said the arithmetic is simple. The bills include a $3 million bond for increased monitoring of acidity-causing pollution along Maine’s coast, two measures to limit known contributors to acidification and a bill to establish a three-year effort to continue a concerted fight against acidification. Devin led a commission on ocean acidification established by the Legislature last year. 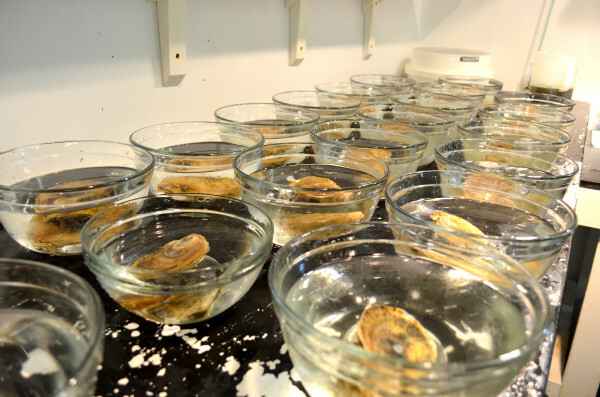 Central to its task was developing ways that Maine can try to limit the effects of ocean acidification. The commission released a 122-page report Thursday, outlining its findings and its vision for fighting acidity in Maine’s waters. All told, the pH level in the Gulf of Maine is 30 percent more acidic than it was before the Industrial Revolution, according to the Rockland-based Island Institute. That acidity makes it hard for some marine species to develop their shells, making it much more challenging for them to survive. Maine shellfish harvesters have been warning about increasingly acidic coastal waters — they call it “dead mud” — since at least three years ago. About the same time, Washington state suffered a rapid die-off in its oyster fishery, in which larval oysters were dissolving before they had a chance to mature. Acidification is particularly dangerous for Maine, said Meredith White, a biological oceanographer at the Bigelow Laboratory in East Boothbay. “Data indicate that Maine is more susceptible to ocean acidification than the southeastern seaboard or the Gulf of Mexico because Gulf of Maine waters are less buffered, which means they’re less resistant to changes in ocean chemistry,” she said. Maine’s coastal waters are at even greater risk because atmospheric carbon dioxide — the main source of increased acidification globally — is compounded by rainwater and other runoff from the mainland. Bill Mook owns a commercial oyster hatchery on the Damariscotta River in Walpole. He said Thursday that research has shown that, unlike in the open ocean, acidity in the Damariscotta River is attributable equally to global and local sources. That’s where two bills by Sen. Chris Johnson, D-Somerville, come in. Johnson, who co-chaired the commission with Devin, focused on the short-term, local actions Maine can take to decrease runoff pollution that contributes to acidification. The two bills, which are still being drafted, would focus on acidity-raising runoff from farms and from inadequate septic systems, Johnson said Thursday. The other bills, one by Devin and one by Rep. Wayne Parry, R-Arundel, propose more long-term action. Parry, a lobsterman who also served on the commission, said he’ll propose a roughly $3 million bond to pay for increased monitoring of point-source pollution along Maine’s coast. The idea, he said, is to learn more about what contributes to acidification, and where and when it’s seeping into Maine’s coastal waters. The commission identified this kind of localized data as a blind spot in the current research on acidification. “We need [monitoring] in many areas throughout the state, so we know where the problem areas are, where we can do some mitigation,” Parry said. Devin’s bill would extend the lifespan of the commission — originally slated to be dissolved after publication of its report — by three years. The commission’s report states that its ongoing existence is necessary to maintaining a sustained effort on fighting acidification. Devin also noted that several eastern coastal states, including New Hampshire, Massachusetts and Rhode Island, have followed Maine’s lead by passing bills targeting ocean acidification. At the federal level, funding for fighting acidification has increased from $8 million a few years ago to $30 million this year, Devin said. In Washington, U.S. Sen Angus King, I-Maine, and U.S. Rep. Chellie Pingree, D-Maine, pledged to continue their work on advocating for research, funding and policies that fight acidification. Last year, Pingree introduced a bill in Congress that would require the U.S. to study acidification in Maine. Correction: A previous version of this story inaccurately stated that the pH level in the Gulf of Maine is 30 times more acidic than it was before the Industrial Revolution. The correct increase in acidity over that time is 30 percent.